Looking for the NEW Jeep Grand Cherokee Hood Graphics? We have the TRAIL HOOD in stock and ready to go! 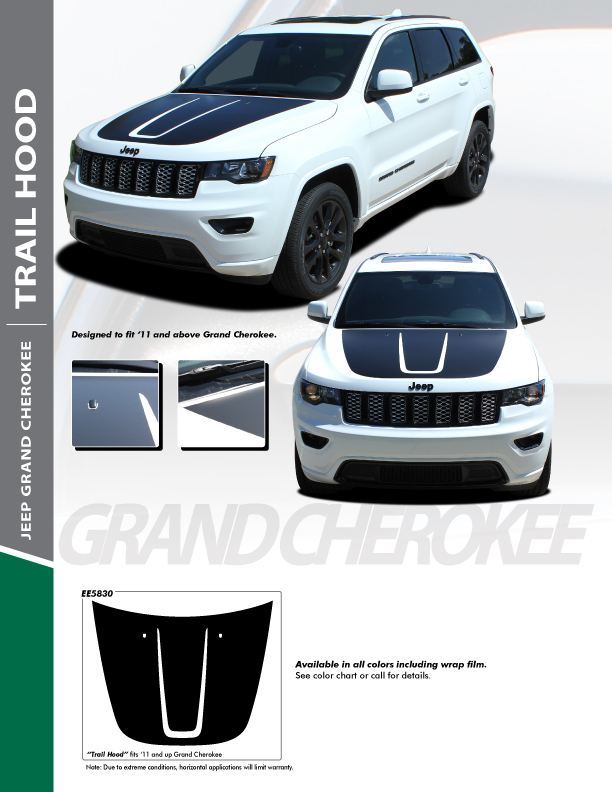 Upgrade your Jeep Grand Cherokee Stripes with this factory style Jeep Grand Cherokee Decals for 2011 2012 2013 2014 2015 2016 2017 2018 and 2019 with our amazing TRAIL HOOD Jeep Grand Cherokee hood decal. This Grand Cherokee Trailhawk decal style hood vinyl stripes decals kit. We precision cut this Jeep Grand Cherokee Decals Stickers Trailhawk style hood vinyl decal graphic stripes from the finest quality vinyl so that you get an easy fit and so that you will get vinyl decals that will last. Our 2011-2017 2018 2019 Grand Cherokee Hood Graphics TRAIL HOOD Grand Cherokee Stripes, Grand Cherokee Hood Stripes, Grand Cherokee Side Door Stripes.